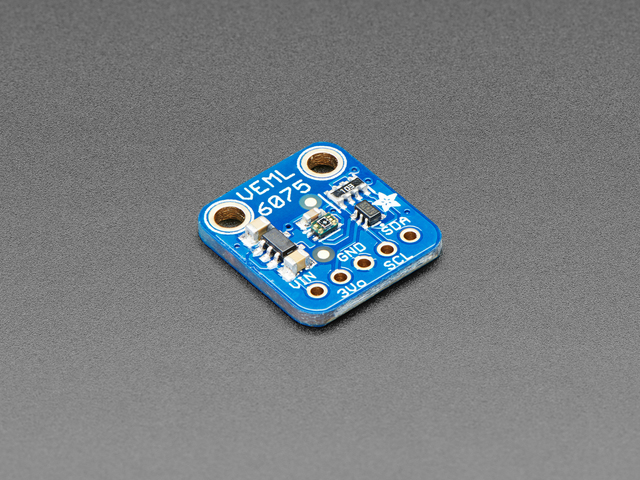 This little sensor is a great way to add UVA and UVB light sensing to any microcontroller project. The VEML6070 from Vishay has both true UVA and UVB band light sensors and an I2C-controlled ADC that will take readings and integrate them. The sensor also comes with calibration registers so you can easily convert the UVA/UVB readings into the UV Index. Compared to our other UV sensors, this one actually does a pretty good job of getting accurate UV data. Unlike the Si1145, it has a real UV sensor, and in contrast to the VEML6070, it has dual band senors and an Index calculation algorithm. So far this is the best UV sensor we've got! This UV sensor works great with 3 or 5V power or logic, its nice and compact, and its easy to use with any I2C-capable microcontroller. We have example code and libraries for Arduino and CircuitPython/Python. Each order comes with one assembled PCB with a sensor, power regulator, level shifting and a small piece of header. Some light soldering is required to attach the header but its a fast task! This guide was first published on Sep 26, 2018. It was last updated on Sep 26, 2018. This page (Overview) was last updated on Apr 24, 2019.